Each year, e. TV Ghana, your world of quality, dedicates the month of September to celebrate and promote Made in Ghana goods and services. To mark the climax of e. TV Made in Ghana Month celebrations, e. TV Ghana, your world of quality entertainment, over the weekend organized a highly patronized inter-regional cooking competition and health screening exercise at the Ghana Commercial Bank (GCB) car park at the Kwame Nkrumah Circle. This year’s Made in Ghana celebration dubbed ‘Living Healthy the Ghanaian Way’, celebrated indigenous local foods and local health treatments in Ghana. The cooking competition, which was the climax of the activities, lined up for the 6th edition of the e. TV Made in Ghana Celebration, allowed participants the golden opportunity to cook and showcase indigenous Ghanaian delicacies around the country. During the cooking competition, Isaac Neequaye from Greater Accra prepared Kpokpoi; Yaa Gyamfuaa from Brong Ahafo prepared Fufu with Gyinkasi Soup; Leticia Dansowaa from Western Region prepared Enkokoa; Philomena Bentil from Eastern Region Prepared Fufu and Ebunuebunu. Urica Davies from Volta Region prepared Pinor; Joe Owuahene Acheampong from Ashanti Region prepared Nihuaa; Gladys Adiikanbasi from Northern Region prepared Tubaani ; Rebecca Aboko from Upper East prepared Gbengari; and Francis Kadziro from Central Region and Akoda Beikien from Upper West prepared Bankye Ampesi. After tasting, the judges pronounced Joe Owuahene Acheampong from Ashanti Region as winner of the e. TV Made in Ghana Cooking Competition. Mr. Acheampong took home an award package comprising of Tabletop Fridge, crates of drinks from Accra Brewery Limited (ABL), products from Nkulenu and Home foods. Francis Kadziro from Central Region came second and he also took home a Stove, crates of drinks from ABL, products from Nkulenu and Home foods. 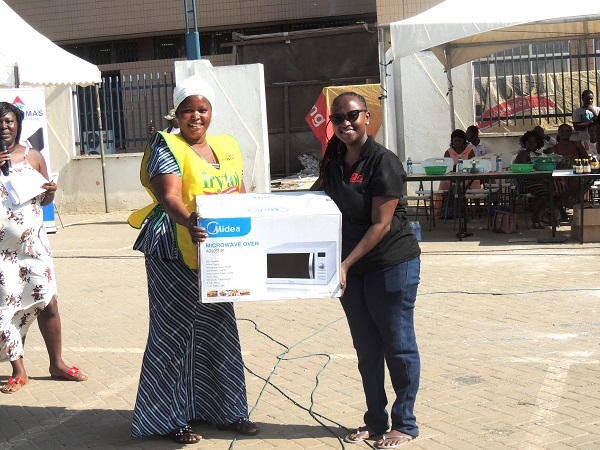 Gladys Adiikanbasi from Northern Region placed third, took home a microwave, crates of drinks from ABL, products from Nkulenu and Home foods. However, all participants were presented with hampers that had several products from all the sponsors. Meanwhile, patrons of the e. TV Made in Ghana Cooking Competition also went through free medical screening ranging from prostate check, blood pressure, body mass index (BMI) and eye screening among others from Medi Moses Clinic & Herbal Centre, St. Thomas Eye Hospital and J.L. Danquah Clinic. The e. TV Made in Ghana Cooking Competition and Health Screening was sponsored by Accra Brewery Limited, Medi Moses Clinic & Herbal Centre, J.L. Danquah Clinic, Nkulenu Industries Ltd, Homefoods , Gaslinco Enterprise, and Frytol.